Unique pressure control technology for highly demanding applications. The Equilibar Back Pressure Regulator is our core technology. It features a flexible diaphragm as its only moving part to provide frictionless, stable operation. The Equilibar’s dome- loaded, multiple orifice design offers instantaneous control and exceptional precision for the most complex applications. Inlet pressure matches reference pressure within 1-2% through wide flow range – better than 0.5% in most research applications. Frequenty used in industrial test benches for liquids and gases. See performance curves. Our many material options include 100% PTFE construction as well as Hastelloy C276 and SS316L. Our products can be made compatible with virtually every aggressive chemical known. Details on chemical compatibility. Equilibar’s Research Series back pressure regulators offer precision performance for high pressure applications up to 10,000 psig / 689 bar(g). These regulators provide stable inlet pressure across widely varying flow rates, for liquid, gas, and mixed phase fluids. Our 1/16″ tube fitting option provides for total dead volume in our back pressure regulator of 0.2 ml. Useful for High Performance Liquid Chromatography and gas analysis services requiring low dead volume. Our unique technology allows for precision across a 1000:1 flow range in most applications. Up to 10,000:1 in many research applications. Our unique design allows for liquids and gases to flow together while maintaining incredible inlet pressure stability. Our multiple orifice design is ideal for minimizing pressure disturbances in two-phase flow. By far the lowest flow rate available, down below Flow Coefficient 1E-8 (<0.1 ml/min gas or 0.001 ml/min liquid). Details on our ultra low flow rate performance. Using delicate diaphragms, our technology gives precision down to 0.02 psig / 1.4 millibar(g) (0.5 in H20 / 12.7 mm H20). 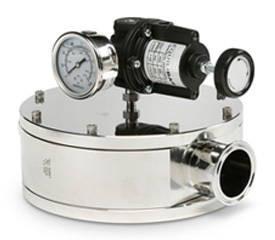 See details of our low pressure regulators. Our stainless diaphragms can be used to 300°C in many applications. We also have a beta regulator for applications up to 450°C, useful in petrochemical gas analysis and research that use high temperature reactors. Note: the terms "Back Pressure Regulator" and "Back Pressure Valve" are often used interchangeably. On this website, we prefer using the "Regulator" term to refer to both.